Skopje is a city which has undergone a series of traumatic transformations – including the devastating earthquake of fifty years ago, the socio-political changes at the beginning of the 1990’s, and the more recent urban interventions that define the so-called ‘Skopje 2014’ project. The city is fast losing its sense of identity, with numerous valuable modernist buildings being erased or transformed beyond recognition with new, so-called ‘Baroque’ facades. The city’s rich modernist heritage is being denied and the city’s authenticity and spirit is under threat; a general sense of loss is ever-present and the intelligentsia feels an overwhelming sense of powerlessness. In this current climate, the need to unearth, collect, document and share valuable and relevant research, in order to encourage and enable critical thinking regarding the disappearing identity of the city, is a concrete form of action/ reaction to the present reality. OPEN ARCHIVE is an art-architecture archival project, the very notion of this ongoing, developing project being defined as an archive, embodies a sense of nostalgia, a certain yearning for the past and all that has been irretrievably altered or lost; at the same time, it suggests that ‘looking back’ could be important for looking forward. 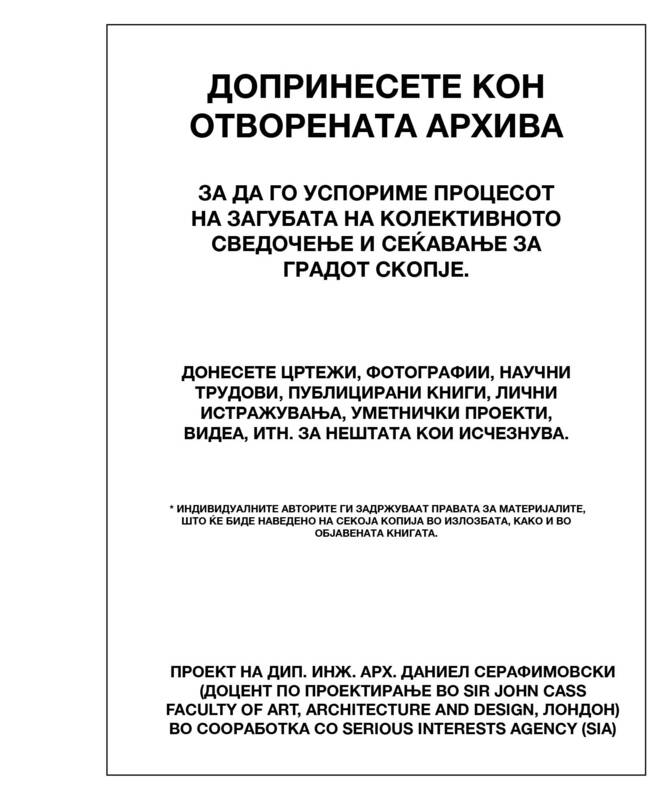 OPEN ARCHIVE is a project by Daniel Serafimovski (MA) (senior lecturer at Sir John Cass Faculty of Art, Architecture and Design, London) in collaboration with us – Serious Interests Agency (SIA), Skopje.